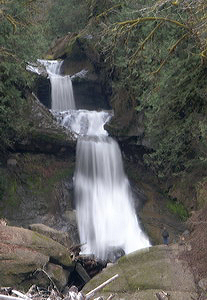 A Waterfall Lover's Guide to the Pacific Northwest 5th ed. UPDATE: This waterfall is no longer accessible! The landowner had to close the private trail due to vandalism. Go on to the next entry. 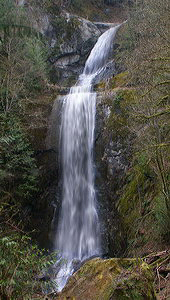 When last checked, private landowners were not allowing access to either Sygitowicz Creek Falls (u), USGS Deming (1994 nl) or Tinling Creek Falls (u), USGS Deming (1994 nl). Anderson Falls (u), USGS Lawrence (1994 nl), is not likely to be reached.